I like to think that I am aware of many bicycle routes in Pueblo. Today I discovered something I was not aware of. 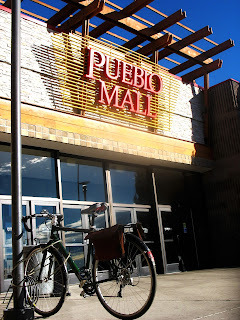 My excuse is that I don't often have a need to venture to the corporate side of town, but today I was slanging a few hats to the owner of the Poppy Seed inside Pueblo Mall. The weather was gorgeous so I decided to explore a bit and found an excellent, car-free route. The route crosses 8th street to access the Fountain Creek trail, continues north along the trail to the highway 47 interchange. This is where the discovery happened. I had no idea that there was a bicycle version of a cloverleaf interchange there that crossed the creek via a pedestrian/bicycle bridge and paved bicycle trails. Who knew! ?